The Hour-Zero Program has provided us with the resources and expertise needed to confidently manage emergency situations. When an emergency happens, teachers are called upon to be leaders for their students and vital members of their school emergency response team. Hour-Zero provides teachers with resources and training to succeed in their roles. Teachers have a deep commitment to their students, as is evident in the countless number of selfless acts they undertake everyday. Without question, part of this commitment involves having the ability, confidence and trust to deal with emergency situations. Hour-Zero helps teachers honour this commitment by providing practical and easy-to-use tools for use in your classroom and as part of your school emergency response team. Knowing what to do at the time of an emergency starts with understanding the basic components of your plan. Protocol Specific On-line Modules – short tutorials on how to executing a protocol; including "what ifs"
A large part of being a member of your school's emergency response team is about trust - trust in yourself, trust in your team, and trust in your Plan. 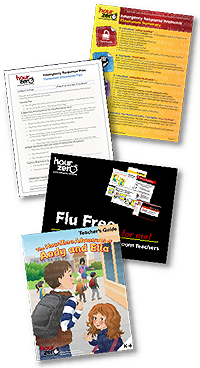 Hour-Zero offers teachers the resources they need to leverage their emergency plans in the classroom.